Most of us feel like we couldn't live without our mobile phones. I got my first mobile phone from Globe Telecom. It was a MOTOROLA analogue phone ( Motorola were the first company to mass produce the first handheld mobile phone) and Globe Telecom was the only company here in the Philippines that time that offer a postpaid plan and I got one with a number starts with 0917. Today, September 17, is a celebration like no other. This special is all about the customer - a day of giving back and showing everyone how much love and gratitude Globe Telecom has for their loyal patrons and partners. GLOBE TELECOM has always been obsessed about the customer. In everything we do, we strive to create a Globe of Good by treating people right: we empower our employees, make our customers feel valued and special, and ensure that our stakeholders feel confident and rewarded. Everyone is connected by Globe, whether on mobile, Globe At Home, myBusiness, or by the myriad of other ways Globe keeps you linked to your digital lifestyle has a chance to get a special treat or great discount in select stores and restaurants. Allow Globe to pamper you today with exclusive perks like free data for TM and Prepaid customers, at least 100 Rewards points for Postpaid and Platinum customers depending on tenure, free volume/speed boost, Rewards points and other goodies for Globe At Home, Globe Business and Globe myBusiness customers. 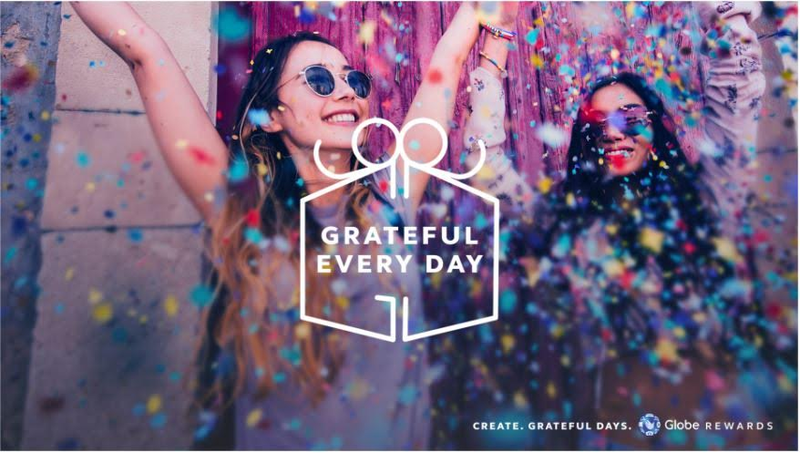 Globe is #GratefulEveryday to each customer who connects with us discovers new ways to enjoy the digital lifestyle together.